Pro-Gun Activists Are Following Parkland Students Around U.S.
VICE News reports that a group of local gun rights activists called the Utah Gun Exchange showed up at the Salt Lake City stop of a nationwide, pro-gun control tour organized by survivors of the Marjory Stoneman Douglas High School shooting. According to VICE News, the Utah Gun Exchange people have been following the Parkland students around the country in “a military-style armored vehicle” and holding their own counter-protests. Utah, it is worth noting, is remarkably lenient about the sale and regulation of guns within the state. According to the Giffords Law Center to Prevent Gun Violence, Utah does not require gun dealers or gun purchasers to obtain licenses, and does not require gun owners to register their firearms. Utah also allows the open carry of unloaded handguns in public and does not impose any kind of waiting period on gun purchases. What you have in Utah, as is the case in so many other states, is a complete void of regulation. And yet, the posture of Robinson’s group seems to treat gun owners as though their rights are under attack. It’s almost as if.... they’re being cynical about the whole exercise. 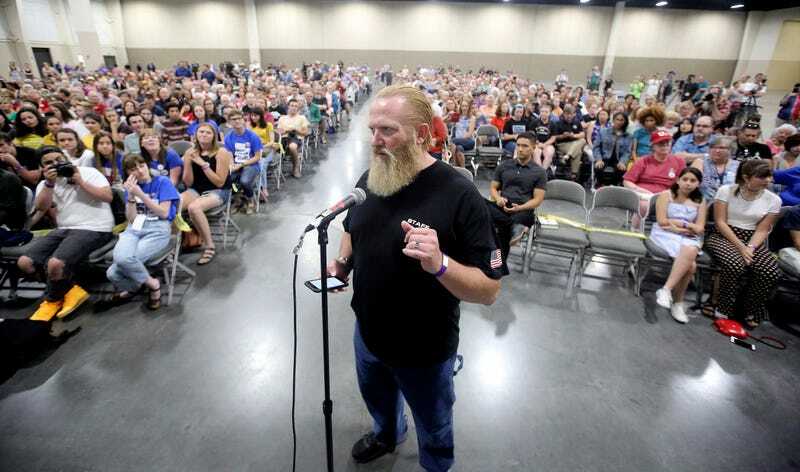 Another younger questioner asked why he gets so many mean texts whenever he goes to the shooting range and why so many people heckled the Utah Gun Exchange’s counter-protest (titled March Before Our Lives). A worthwhile inquiry. The panel pointed out, helpfully, that counter-protesting “something that is literally called March For Our Lives” is a bad look.